Athletics 0 (+16), Close Combat: Unarmed 1 (+6), Deception 0 (+4), Expertise: Krypton 10 (+11), Insight 0 (+5), Intimidation 0 (+4), Perception 4 (+9), Persuasion 6 (+10), Stealth 0 (+2), Technology 5 (+6). Motivation: Kara feels responsible to live up to the example set by Superman and to exemplify the best of Krypton. Identity: Supergirl tries to maintain an alternate identity as Kara Danvers, and attents Metropolis University. Immaturity: Supergirl is very much still a teenager learning her way in the world and deciding who she will be. She is much more emotional than her cousin, and her powers much less restrained (leading to the early impression that she was more powerful than he). Power Loss: Kryptonian powers depend on the light of a yellow sun; they fade slowly away from it, and immediately under the light of a red sun (or its synthetic equivalent), and her STR & STA drop to 1. They are also ineffective against direct magical effects. Relationships: Supergirl is close to Superman, Lois Lane, and Superboy; she is good friends with Wonder Girl as well. 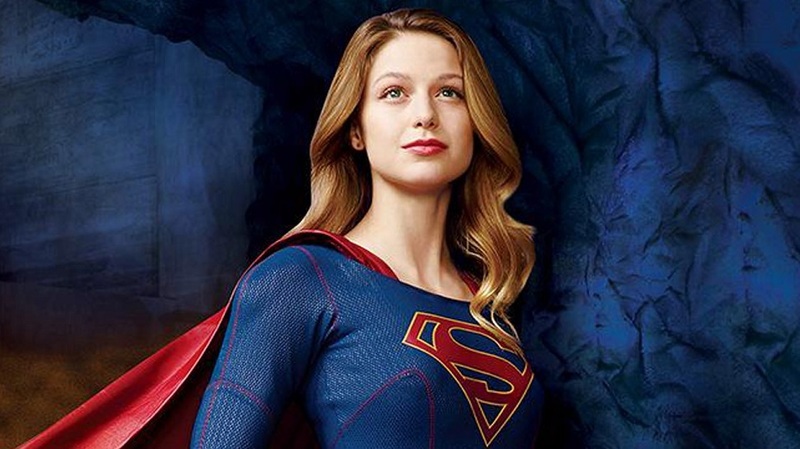 Responsibility: Supergirl feels a strong sense of responsibility to live up to Superman, while simultaneously trying to escape his shadow and establish her own identity. Weakness: Kryptonians are vulnerable to kryptonite, though it does not cause them to lose their powers. Kryptonite exposure is an affliction causing agonizing pain, resisted by Fortitude; victims are Dazed & Vulnerable, Stunned & Defenseless, and Paralyzed. Prolonged exposure causes death. Supergirl is a long time favorite of mine. I got hooked on her through the Legion of Super Heroes, where I found her a lot more interesting that Superboy or Mon-el, her power-level peers. And now she’s got her own TV series, while her better known cousin doesn’t – who would’ve predicted that five years ago? I love Melissa Benoist’s take on Kara, but I’m not so fond of the setup the TV show has created. I prefer a younger take on Kara, still in her teens, still figuring out who she is – TV Kara is doing some of that, but is too much mapped on to being Clark lite rather than doing her own thing. Supergirl doesn’t have all Superman’s raw power, but she’s much more inclined to use her other abilities than he is. Generally the last thing she tries is flying in and slugging it out; if she’s not using heat vision or super breath, she’s power stunting something unexpected. She’s also much more likely than Clark to just beat the living crap out of someone who threatens her family – while she tries to live up to Clark’s standards, she’s also emotional and very dangerous when angry. Acrobatics 2 (+6), Athletics 4 (+6), Close Combat: Unarmed 3 (+7), Deception 8 (+10) [Taunt], Expertise: Photojournalism 8 (+9), Insight 0 (+3), Intimidation 0 (+2), Investigation 7 (+8), Perception 5 (+8), Persuasion 2 (+4), Stealth 2 (+6), Vehicles 5 (+6). Motivation – Thrills & Doing Good: Jimmy loves adventure. But he makes sure that while he's having fun, it's benefiting people. Accident – Weirdness: Jimmy has an uncanny knack for stumbling into the most improbable and dangerous situations. Relationships: With Superman, of course, but also Lois Lane, Perry White, and his sometime-girlfriend Lucy Lane. With his popular image stuck in the early ‘60s, most people don’t realize that Jimmy Olsen is supposed to be cool. Far from being a bowtied nerd, Jimmy used to be living a life of excitement and adventure kids could – and did – only dream about! He’s gained and lost superpowers more times than he can count, traveled to Apokolips and New Genesis, befriended gods, married an ape, and documented it all for the Daily Planet. And that was before he turned eighteen! Jimmy has an amazing knack for blundering into adventure. If the Grim Reaper is answering Uber calls in Metropolis, Jimmy will end up riding with him. He’s been turned into a giant turtle-man and a human octopus. Darkseid used him to story the spirits of the New Gods. Jimmy’s life is very, very weird. Jimmy is a thinker, not a fighter; while he throws a pretty good punch, he’s more likely to trick his way out of trouble – unless he calls Superman. He’s also fond of disguises to conceal his identity when working on a story under cover. He has amazing breadth to his talents, and picks up new things on the fly constantly. I think casting Mehcad Brooks as Jimmy in Supergirl was an amazing idea. The fact that he's physically so unlike what people have come to think of Jimmy lets him take the character back to his roots, and I think he did a great job of it in the first season. Motivation – Doing Good: Krypto tries to be a good dog. Disabled – Dog: Krypto cannot speak or use his paws to manipulate objects, and while he’s smarter than most dogs, he still sees the world from a dog’s perspective. Power Loss: Kryptonian powers depend on the light of a yellow sun; they fade slowly away from it, and immediately under the light of a red sun (or its synthetic equivalent), and his STR & STA drop to 2. They are also ineffective against direct magical effects. Relationships: Krypto will do what Supergirl, Lois, Superboy, or the Kents want, but Superman is his master. Weakness – Body Language: Like most dogs, Krypto is at −5 to all Bluff attempts. Weakness – Kryptonite: Kryptonians are vulnerable to kryptonite, though it does not cause them to lose their powers. Kryptonite exposure is an affliction causing agonizing pain, resisted by Fortitude; victims are Dazed & Vulnerable, Stunned & Defenseless, and Paralyzed. Prolonged exposure causes death. Krypto’s a deceptively tough concept to get right. On the one hand, “Superman’s dog” is a very simple idea. On the other, it gets goofy really easily. But Krypto’s presence, like the Elongated Man’s, is one of the signs of the health of the DC Universe; when Krypto is eliminated, DC’s headed for a dark age. 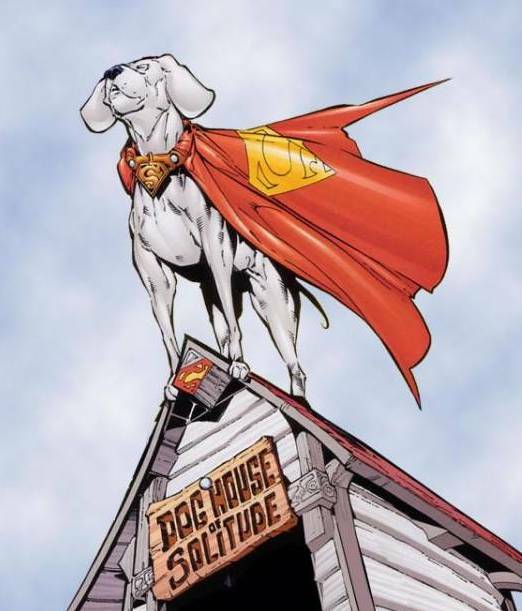 Krypto is probably the most lethal of the Superman Family, because he is, at the end of the day, a dog. If you hurt his people, he will bite your throat out if he can. He is faultlessly loyal, and, unless you seriously hurt one of his people (which, given they’re mostly invulnerable, doesn’t happen that often) he’s friendly, playful, and helpful. He’s super-smart enough to understand most simple commands, and knows that the Man likes it when he helps people, particularly those in danger. Athletics 0 (+0), Close Combat: Unarmed 3 (+5), Deception 2 (+4), Expertise: Journalism 11 (+14) [Skill Mastery], Expertise: Politics 6 (+9), Insight 4 (+8), Intimidation 4 (+6), Investigation 4 (+7) [Contacts], Perception 0 (+4), Persuasion 4 (+6) [Leadership], Stealth 0 (+0). Motivation – Doing Good: Perry sees journalism as a calling, a form of public service as vital as any super-hero’s job. Enemy – Lex Luthor: Perry is one of the few powerful figures in Metropolis willing to take on Lex Luthor. Quirks: Perry is seldom without a cigar, even in this era of tobacco-free workplaces. His exclamation, “Great Caesar's Ghost!” and demands that Jimmy “Don’t call me Chief!” are signatures. Relationships: With Clark Kent, Lois Lane, Jimmy Olsen, and his wife Alice. 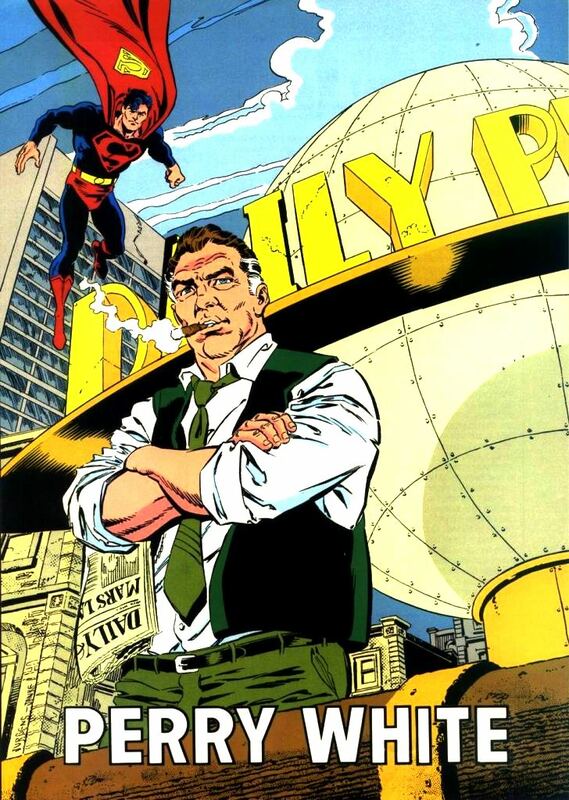 The Daily Planet wouldn’t be the Daily Planet without Perry White. He’s tough, cranky, fair, wise, and a paragon of journalistic ethics. With Perry White as a role model, it’s no wonder the Planet has reporters like Lane, Olsen, and Kent. Perry’s history has changed around a number of times; he has sometimes been Luthor’s childhood friend, and may be a former mayor of Metropolis. What never changes is his love of journalism and the paper he edits, and his absolute devotion to printing only the truth. And I would really love to see Perry White and J. Jonah Jameson clash.